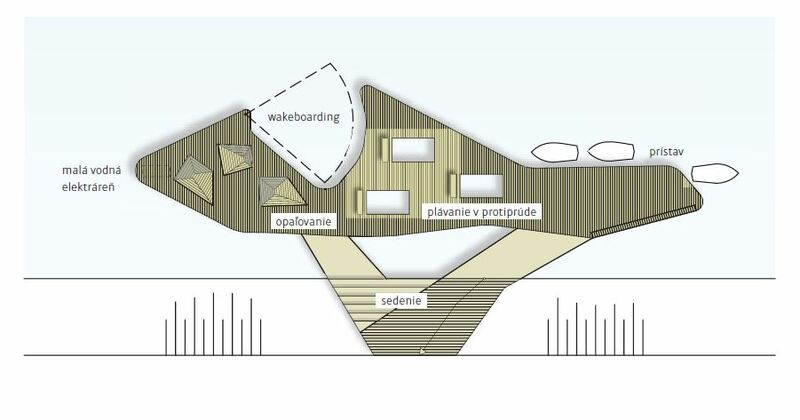 Within our project we were not only trying to use the Danube River as a place-forming phenomenon or a physical space located in the centre of Bratislava, but also to use its power and movement. Our jetty focuses on activities powered by the flowing water. Its top is equipped with a micro turbine, which is, under good conditions, able to provide electric power for lighting and for music production on the embankment. We have created three upstream “backwaters” there, in which swimmers can swim at the same point. Their edges and their bottoms under water are secured by a net cage. The third at- traction is water skiing utilizing the back flow. Such skiing will be performed in the space created for this purpose enabling the skier to get in and out of the water comfortably.